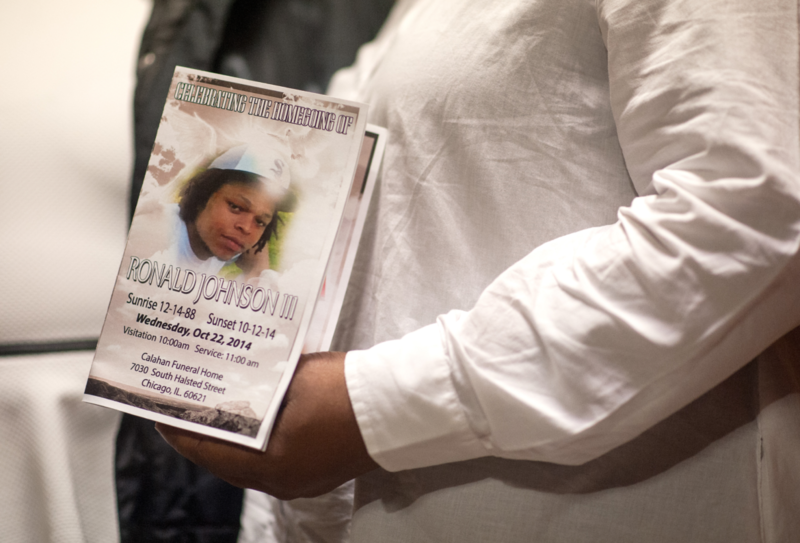 Standing outside Mayor Rahm Emanuel's office on Monday, Dorothy Holmes holds a program from the funeral of her son, Ronald Johnson, who was shot fatally by Chicago Police near Washington Park on Oct. 12, 2014. He was 25. Several parents and family members of young people fatally shot by Chicago police officers walked into Mayor Rahm Emanuel’s office on Monday demanding police accountability. They left two hours later, somber and silent. In a news conference held later outside the mayor’s office, they pressed for more information about their loved ones’ deaths, including information from Independent Police Review Authority investigations into the police-involved shootings. The group also called for indictments against the officers, who they said should lose their jobs. The group was especially angry that a planned meeting with the mayor never materialized. “I came here today to see Rahm Emanuel — and he cowered out and didn’t show up,” said Dorothy Holmes, the mother of Ronald Johnson, who was shot in October 2014 after a traffic stop. Community activist William Calloway, who organized the meeting and rally that followed, said the mayor’s attendance had been tentative and he learned from Emanuel’s staff the morning of the meeting that he wouldn’t be there. Instead they met with Janey Rountree, Emanuel’s deputy chief of staff, and Larry Merritt, an IPRA spokesman. About 74 percent of the 375 people shot by police from 2008 to 2014 were African-American, according to IPRA data. The review authority hasn’t ruled any of the shootings — which include 117 fatalities — unjustified. A comprehensive plan for improving the Chicago Police Department’s relationship with African-American communities. A new “civilian police accountability council” to replace the Independent Police Review Authority that currently investigates allegations of police misconduct. The mayor’s commitment to “provide oversight and transparency at the Homan Square police facility,” the focus of recent allegations of illegal police interrogations. An investigation into unpaid suspensions of officers involved in police shootings. An ordinance providing reparations for survivors of police torture and the revocation of former police commander Jon Burge’s pension benefits. Neither IPRA nor the mayor’s office could be reached for comment. Holmes said she is still waiting to hear from the Cook County state’s attorney’s office about whether charges will be pressed in the fatal shooting of her son, who police said pointed a gun at them, which Holmes refutes. She has filed a federal lawsuit against the city and Police Department. Holmes said Johnson, her only son, was fun and caring. He had five kids — four girls ages 7, 6, 5 and 3, and a 2-year-old son. His death “just tore the family apart,” she said. Dante Servin, the Chicago police officer who in 2012 fatally shot Rekia Boyd, an unarmed black woman, is the first officer since 1995 to be indicted in the killing of a civilian. In related City Hall news Monday, Ald. Ed Burke (14th Ward) announced that the Finance Committee he chairs will hold an April 14 hearing on the Burge Torture Reparations Ordinance. The law, which would offer a formal apology to survivors of police torture, would set aside $20 million in reparations. It had been stalled in committee since Ald. Joe Moreno (1st Ward) and Ald. Howard Brookins (21st Ward) filed it in October 2013. Some aldermen say they want to change provisions in the Fraternal Order of Police contract that makes it possible for officers like Jason Van Dyke, who shot a 17-year-old teenager 16 times, to receive additional protections in criminal investigations.